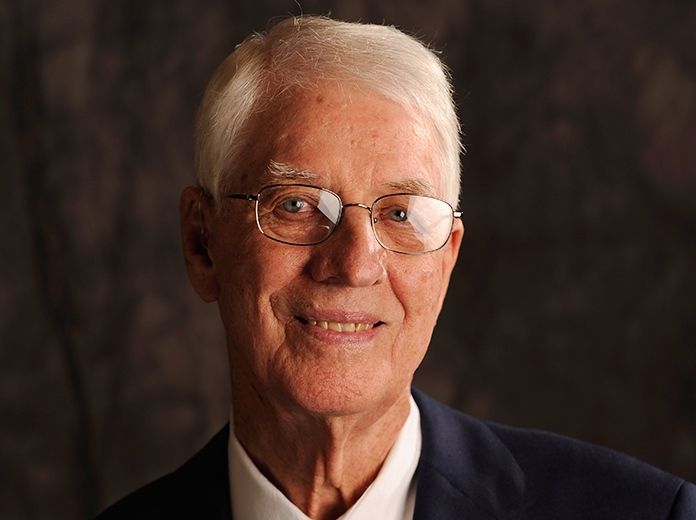 (NEWTON, Iowa – July 17, 2015) – Mason Mitchell brought out Superman again. And, that meant he was headed to victory lane. Mitchell, who grew up in West Des Moines, Iowa, won the #ThisIsMySpeedway150 at Iowa Speedway Friday night, winning at the .875-mile facility that he considers his home track. Two late race cautions caused the race to extend beyond its advertised 150 laps. Mitchell, in the No. 78 Karl Chevrolet, passed Kyle Weatherman on the final lap, which was lap 159, for the win. Weatherman finished second in the No. 22 Crosley Brands/Cunningham Motorsports Dodge, his second runner-up finish at Iowa Speedway in three years. His Cunningham Motorsports teammate Tom Hessert, driving the No. 77 Barbera’s Autoland Dodge, was third. Austin Cindric, in the No. 99 AutoZone Ford, was fourth. Matt Tifft completed the top five in the Federated Auto Parts No. 52 Chevrolet. Austin Wayne Self finished sixth in a car owned by Mason Mitchell, Blake Jones finished seventh in the No. 38 Asphalt Services of Tenn./Blake Jones Racing Ford while ARCA Racing Series point leader Grant Enfinger finished eighth. Also earning top 10 finishes were Todd Gilliland in the Renton Coil Springs No. 55 Toyota and David Levine in the MOMO-TraqGear-Ford Performance Ford. Blake Jones and Levine gave Lira Motorsports two top 10 finishes in a race that saw nine cautions for 56 laps and took one hour and 42 minutes to complete. Weatherman won the Menards Pole Award presented by Ansell but it was Matt Kurzejewski surging to the lead on the first lap – and staying there until a round of pit stops at lap 44. Kurzejewski led a career-best 62 laps before a spin late in the race sent him to the 15th spot, but still on the lead lap. Weatherman was frustrated, but gracious in defeat. He had the lead on the first green-white-checkered restart and was near the finish when the final caution came out, leading to the last restart. Brandon Jones led 31 laps in the No. 25 Ansell-Menards Toyota, but, he, too, was shuffled back on a restart, then spun, before finishing 11th. 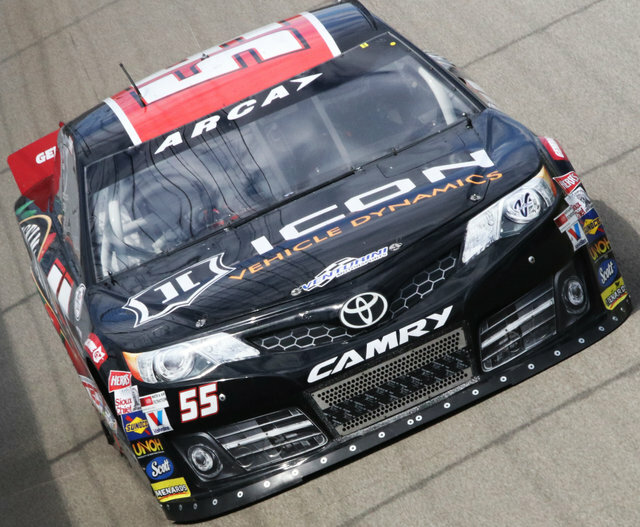 Cindric led 29 laps in his ARCA Racing Series debut. Hessert never led but was able to gain some ground on Enfinger’s championship point lead by finishing five spots in front of Enfinger. Josh Williams entered the race at Iowa Speedway in second but an accident sent him to the garage after lap 99. He finished 22nd. “There were parts of the race where we were pretty good, but overall just a little too tight to contest for the win or to pass those cars,” Hessert said. “A couple of those late restarts helped us and we were able to gain some spots. The #ThisIsMySpeedway150 was the 12th ARCA Racing Series event of 2015 – leaving eight races to go, including the Sioux Chief PowerPEX 200 presented by Federated Car Care at Lucas Oil Raceway in Indiana on Friday, July 24. That race is a long celebration away, however, for Mitchell. 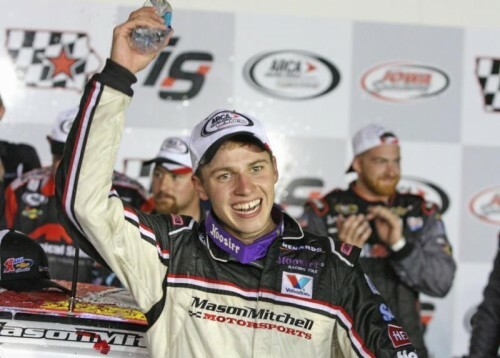 The 21-year-old defending ARCA Racing Series champion was racing in just his third race of 2015, but one he has had circled on his calendar for months. He qualified seventh and seemed to pit on every caution, making changes to the car throughout the race. Suddenly, with about 45 laps to go, he was contending for the lead. It was his second career win – the first coming during his championship season last year while at Chicagoland Speedway. It was at Chicago that he first brought out the ‘Superman’ shirt under his firesuit after a win. He did it again Friday, this time after climbing from the car on the Iowa Speedway front stretch. Track officials said Mitchell became the second driver from Iowa to win at the track, the other being Brett Moffitt in a NASCAR K&N Pro Series race. The win was the second straight for Mason Mitchell Motorsports, following up Self’s win at Winchester Speedway June 28. The #ThisIsMySpeedway150 will re-air on Fox Sports 1 at 3 a.m., July 18, and again at 3 p.m. on Fox Sports 2 on July 22.